I n the 1960s when India was facing an acute food crisis, the proud Prime Minister Indira Gandhi felt humiliated begging for foodgrain from the United States. Once, when she hung up the phone after talking to President Lyndon Johnson she was reported to have said angrily, “I don’t ever want us to have to beg for food again.” She saw that India did not, after launching the successful Green Revolution. Decades later, although we have not reached the position to beg for food, the plight of farmers is indeed alarming. It has come to the focus once again after farmers in two of the largest BJP-ruled states of Madhya Pradesh and Maharashtra have resorted to agitations demanding better prices, loan waivers and action on other farm-related issues. While Maharashtra has already been battling with the growing number of farmer suicide and other problems, Madhya Pradesh has been on the boil since last week when farmers launched an agitation seeking loan waiver and better crop prices. Five farmers were killed in police firing at Mandsaur on Tuesday (a sixth died later), while six others were injured. Fearing a spillover, the neighbouring UP Chief Minister Yogi Adityanath also has announced some relief measures for farmers. The Patidars, who are spearheading the agitation, are the BJP’s core supporters. Of the six dead farmers, five are from the Patidar community. In Gujarat, too, the Patidars, led by Hardik Patel, have been agitating against the state’s BJP regime. Notwithstanding the good monsoon last year and predictions of another good year in 2017-2018 the agricultural sector may not be out of distress. There was normal rainfall in 2016 after severe drought during the previous two years. The country also registered record foodgrain production in 2016, about 8.6 per cent more than the previous year. India is still one of the leading producers of wheat, rice and cotton, and also became the world’s largest rice exporter in 2015, exporting 10.23 million tons. It also became a substantial exporter of wheat and maize in recent years. Prime Minister Modi has promised to double the income of the farmers and the government has increased target of agricultural credit from Rs. 9 lakh crore to Rs. 10 lakh crore in Budget 2017-18. However, despite all these, the farmer’s stir proves that the measures have had no impact on poor and marginal farmers. The plight of the farmers is reaching alarming proportions with thousands of farmers including those from Maharashtra, Telengana, Andhra Pradesh, Tamil Nadu, Madhya Pradesh and Uttar Pradesh agitating for better prices and loan waivers. Successive governments – both State and Central – have not paid heed to their cries for help with the result they are increasingly resorting to drastic methods to deal with the stress. According to one piece of data , a farmer commits suicide every 30 minutes. The Agricultural and Rural Transformation Centre (ADRTC) of the Institute for Social and Economic Change (ISEC), Bengaluru, on investigation has found that the suicides points to frequent crop failure, vagaries of the monsoon, absence of assured water resources, attacks of pests and diseases, debts, farming and social causes. Why have the farmers been reduced to this status? Primarily, Indian agriculture is largely in an unorganized sector. Most farms are small and economically unfeasible. No systematic institutional and organisational planning is involved in cultivation, irrigation, harvesting etc. Institutional finances are not adequately available and minimum purchase price fixed by the government does not reach the poorest farmer. Exploitation by middlemen continues. Government programmes do not reach small farmers. All these virtually pushes them into the vicious cycle of poverty and debt. What is required as eminent agricultural expert M.S. Swaminathan suggests is a second Green Revolution. The farming sector requires more money and attention. Secondly, there is no credible farmer’s movement in India to focus on the plight of farmers. During the 1970s and 80s, farmer leaders not only managed to mobilise farmers in different parts of the country but were also instrumental in changing the policy on agriculture. There were tall leaders like Charan Singh, Balram Jakhar, Mahendra Singh Tikait and Sharad Joshi but today the movement lacks a charismatic and visionary leader. There is urgent need for the Centre and the States to address farmers’ concerns. Secondly, proper implementation of government programmes is vital and it should reach the intended beneficiaries. Thirdly, multiple crop cultivation such as coconut, turmeric, apple and ginger should be encouraged. Crop insurance is a must and claims should be settled easily. Fourthly, modernisation of agriculutre is quite important. The Government should also think of creating special agricultural zones on the model of export zones. Alternate sources of income for the small and marginal farmers should be devised. 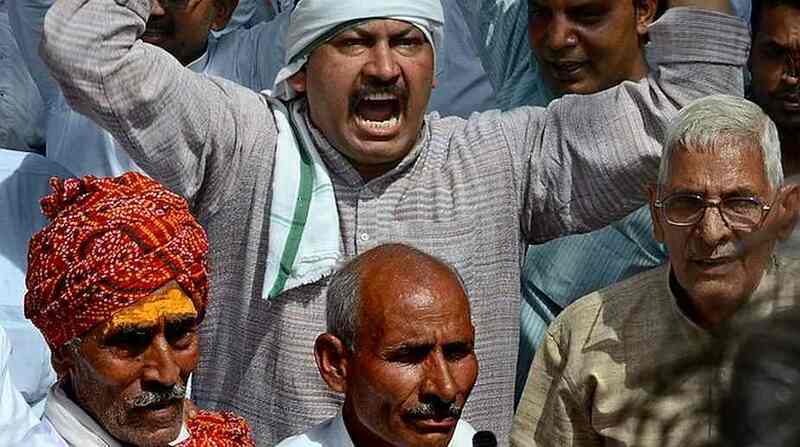 Above all political parties should stop using the farmers’ woes to settle scores with their opponents. Given the fact that almost half of the work force in the country is still engaged in farming, farmers’ woes are naturally an important electoral plank. Most political parties play lip service to the plight of farmers and visit places where suicides occur. Almost all political parties have been in ruling coalitions at some time or the other. What were they doing then? If they have genuine concern, they should come together to redress their woes and should not play with the lives of the farmers.